SANDRA GERING INC presents MICHAEL SCOTT: Recent Painting and Sculpture. This is Michael Scott’s fifth solo exhibition with the gallery. For this exhibition, Michael Scott pairs new free standing sculpture with paintings, both of which continue to explore the conceptual aspect of optics the artist has worked with since the mid 1980s. Michael Scott’s interest in the sculptural nature of his work is brought to the foreground in this exhibition. Highly sensitive to materiality, Scott has always seen his paintings for their three-dimensional qualities. The enamel works in particular have, for the most part, been painted on aluminum grounds and projected off the wall on metal brackets, heightening their objectness. Adding to that, the striped surfaces have had multiple treatments, from matte to glossy and washy to textured. 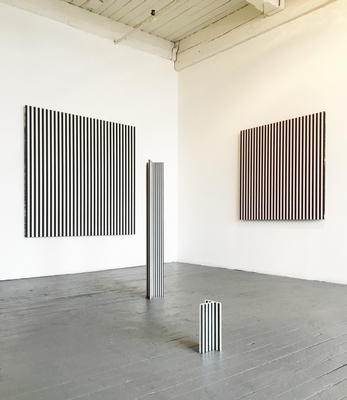 The pillar-like aluminum sculptures on view continue the stripe series, their verticality echoing the line work in a fully three-dimensional object. Michael Scott’s history with linear abstraction dates back to contemporary art’s Neo-Geo movement. Using mathematics to build specific parameters for each work, he creates frisson by painting surfaces that can be difficult to look at. Color, contrast and scale all contribute to the overall optical effect. Michael Scott’s work is meticulous by nature. Fractions and progressions are highly meaningful, as are any diversions into expressionism or gestural mark-making. Taken as a whole, Scott’s stripe works show a sensitivity to nuance that can be likened to the work of Ad Reinhardt, Donald Judd, On Kawara and Josef Albers, as well as any number of Op-Art practitioners. Michael Scott has exhibited internationally since 1989. Venues have included Le Consortium, Dijon & Le FRAC, Nord-Pas de Calais, France; the Grand Palais National Galleries, Paris; Musée des Beaux Arts, La Chaux de Fonds, Switzerland; PS1, New York; Centre National d'art Contemporain de Grenoble, France; Centre Georges Pompidou, Paris; the Museum of Modern & Contemporary Art, Geneva, MAMCO, Geneva, and the Kunsthalle Bern, in Switzerland. A recent overview of Scott’s work was presented at the Centre d’art contemporain, Lausanne, Switzerland. Michael Scott lives and works in New York City.